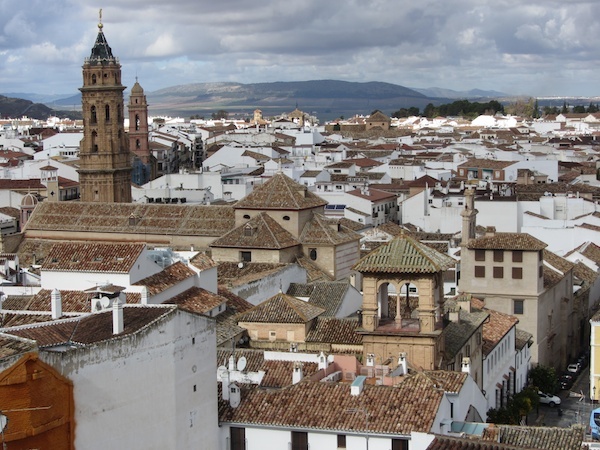 We needed to find a hotel somewhere between Seville and Malaga, and stopped off half way at a town called Antequera. This was an almost random choice, but we liked it so much that we stayed on. It’s a lovely town, founded by the Romans as Antikara, we infer as a midway garrison between the olive groves of the centre and the trading ports of the coast. There are few Roman remains there now, but there are a plethora of city walls, churches and cathedrals, all clambering picturesquely up the steep hillside to the castle. The hotel were keen to direct us toward a nearby restaurant, but we were put off by the coach parking and English menus. Instead we located a couple of nice little bars, cafes, and a superb Michelin recommended restaurant, the Restaurante Reine. This latter is part of a Hospitality School, and when we arrived early and off season there was only one waitress on duty. As far as we could tell, the three of us were the only people in the restaurant, and yet she not only cooked seven impeccable courses but also appeared with the decanter at perfect intervals, and by the time we’d finished our coffees, the kitchen had already been scrubbed clean. 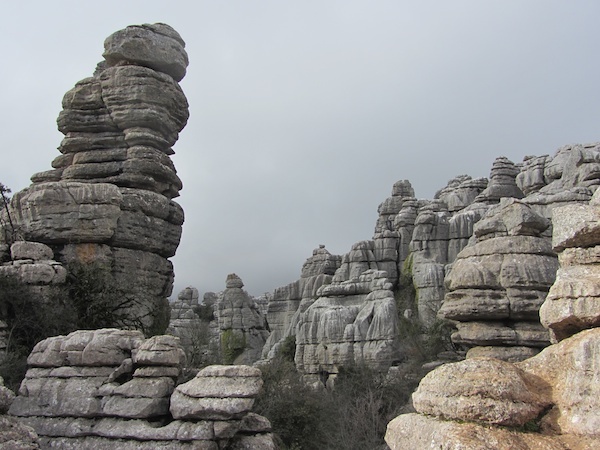 The most popular tourist destination in the area is El Torcal, a wide area of Jurassic limestone that has been eroded into classic and picturesque karst formations. There are two circular hiking routes through the system, and we took the longer 4.5 km one. The sign said that it would take two hours to complete the circuit, and – perhaps uniquely in the history of national parks – it actually did. This is because there is no real path, just markers sticking up as you scramble from rock to rock, and there are innumerable side tracks, tunnels, caves, and high points to be explored. I understand that it is often too hot to visit in summer, but in January the temperature was only just above freezing. We soon warmed up, and made it round just as dusk was falling and the clouds were moving in. Just down the road from El Torcal is Lobo Park, which is a collection of wolves from around the world. All of them are captive-bred, often cubs taken from zoos that don’t have enough room for them. The owners then bottle-feed them so that they become accustomed to humans, although not domesticated. Once released into one of the many large enclosures, the wolves range freely in packs. Our guide explained that they had already fed this week, but she brought a bucket of meat scraps with her and – although wild – they were happy to come close to the fence for a snack. When we were about half way around the park, all of the wolves in the entire valley suddenly started howling, an explosion of joyous sound to which it was impossible not to grin in response. It reminded me of the excitement of sled dogs when they realise that they’re about to go for a run, but what were these wolves so interested in? Our guide, also grinning, explained that the park’s owner, Daniel, had just entered the property. Because he has bottle-fed every one of them almost from birth, he has a very special place in their psyche. This entry was posted in Europe, Spain, Travel on 2014/01/30 by Reinhard.